The primary aim of Hands Together LUDLOW is to provide aid for the vulnerable in and around the town of Ludlow in Shropshire, recognising that existing charities and statutory agencies are increasingly under pressure themselves due to financial restraints. 3. Establishing projects to meet longer term needs. Partnership working is foundational to the collaborative thinking behind all we do. • The relief of people in need by reason of youth, old age, ill health, loneliness, dysfunctional relationships, disability or financial hardship, living in Ludlow and the surrounding villages. • The advancement of community development and the promotion of effective and efficient use of existing charitable resources by building a network of volunteers linking to caring agencies and local businesses in order to fill gaps of provision where they occur. Most of our clients are referred to us by our partner agencies, charities and local organisations. We then aim to find the most appropriate organisation to help, or we use one of our team of volunteers to provide short-term assistance. 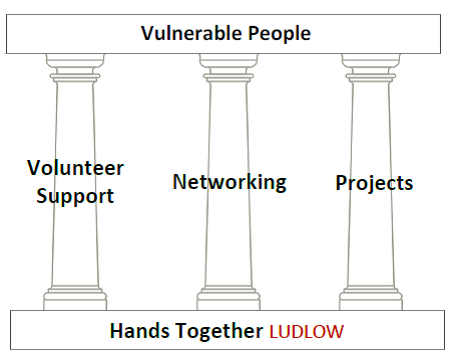 There are many opportunities for volunteering with Hands Together LUDLOW. We need assistance with running some of our projects and establishing new ones, as well as volunteering to help those in need of short-term care. This can include occasional transport, befriending, shopping, IT support, cooking, de-cluttering, gardening, etc.